Get the latest stories and practical tips on all technologies that concern Data Analytics, Big Data Management, Data Migration, Data Integration, Data Pipelines, Data Modelling, and more. This article, in particular, covers the different approaches you could use to perform data migration from MongoDB to Redshift. MongoDB is an open source NoSQL database that stores data in JSON format. It uses a document-oriented data model, and data fields can vary by the document. MongoDB isn’t tied to any specified data structure. That means, there is no particular format or schema for the data in a Mongo database. This aspect makes MongoDB ETL a challenging process. Amazon Redshift data warehouse is an enterprise-class relational database query and management system. Amazon Redshift delivers efficient storage and excellent query performance through a combination of massively parallel processing, columnar data storage, and highly effective targeted data compression encoding schemes. You can read more about Redshift Architecture here. There are two popular methods to move data from MongoDB to Amazon Redshift. Method 1: A ready to use Hevo Data Integration Platform (7 Days Free Trial). 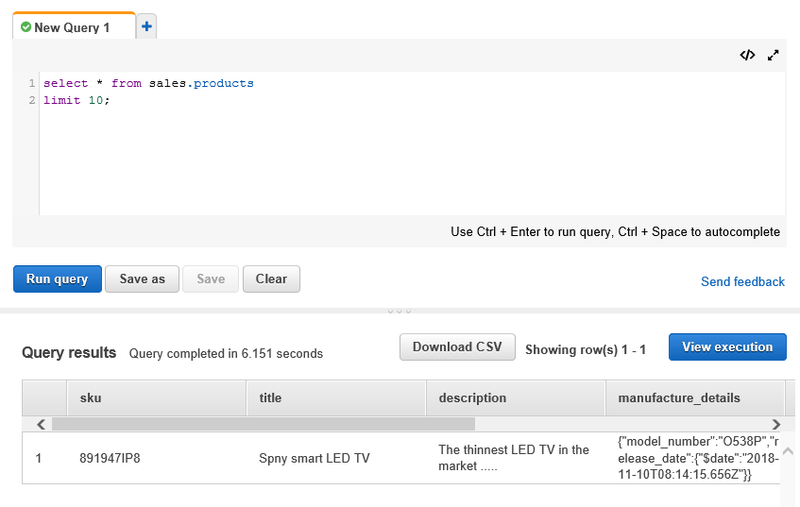 Method 2: Write Custom ETL Scripts to move data from MongoDB to Amazon Redshift. This article covers the steps involved in writing custom code to load data from MongoDB to Redshift. Towards the conclusion, the blog covers the limitations and deficiencies of the approach. For demonstration, let us assume that we need to move a ‘products’ collection into Redshift. This collection is populated with the product details of a manufacturing company. There might be two cases you will consider while transferring data from MongoDB to Redshift. Incrementally load data into Redshift (when the data volume is high). Open the command prompt and go the Mongo Server installation path to run mongoexport command. Run following mongoexport command to generate the output file of the products collection. Note: There might be several transformations required before you load this data into Redshift. However, performing this using custom code will be notably difficult. A tool like Hevo, that provides an easy environment to transform data before moving it into the warehouse might be the right solution for you. Next, you can upload files from local machine to AWS through various means. One simple way is to upload it using file upload utility of S3. This is a more intuitive alternative. You can also achieve this AWS CLI, which provides easy commands to upload it to S3 bucket from local machine. Let us upload the file using AWS CLI. As a prerequisite, you will need to install and configure AWS CLI if you have not already performed. You can refer to the user guide to know more about installing AWS CLI. Run the following command to upload the file into S3 from the local machine. Note: You need to have right permissions to access and upload files to S3 bucket, please refer to S3 access controls for more details. You will need to confirm if the data has loaded successfully. You can do it by running the following query. This should return the record inserted from products file. In cases where data needs to be moved once or in batches only, the custom ETL script method works well. This approach becomes extremely tedious if you have to copy data from MongoDB to Redshift in real-time. In case you are dealing with huge amounts of data, you will be required to perform an incremental load. Incremental load becomes troublesome as there are additional steps that you need to follow to achieve it. Transforming data before you load it into Redshift will be extremely troublesome to achieve. MongoDB’s dynamic structure makes it hard to deal with nested objects and arrays within a document. When you write code to extract a subset of data often those scripts break as the source schema keeps changing or evolving. This can result in data loss. The process mentioned above is frail, erroneous and often hard to implement and maintain. This will impact the consistency and availability of your data in Redshift. You can read more on the ETL challenges while moving MongoDB to Redshift. There is an easier way to replicate data from MongoDB to Redshift. 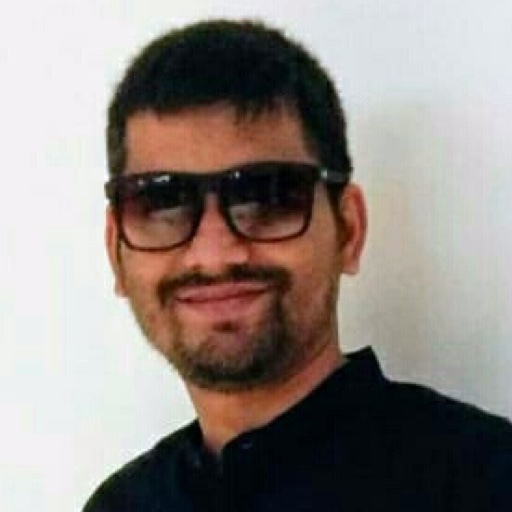 Connect to your MongoDB database. Select the replication mode: (a) Full Dump and Load (b) Incremental load for append-only data (c) Incremental load for mutable data. For each collection in MongoDB choose a table name in Redshift where it should be copied. That’s it! You are all set. Hevo will take care of fetching the data in an incremental fashion and will upload that seamlessly from MongoDB to Redshift in real-time. Additionally, you can bring data from 100s of different sources – databases, cloud applications, SDKs, and more with Hevo Data Integration Platform. This will future proof your data integration set up and provide the flexibility to immediately replicate data from any source into Redshift. 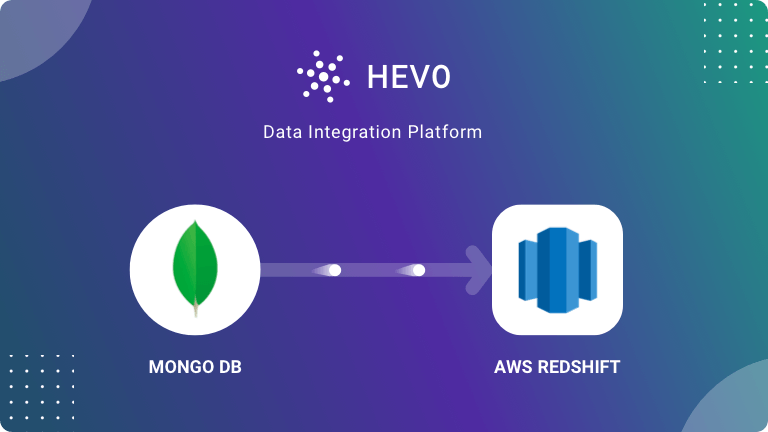 Sign-up for a 7 Day Free Trial to see how easy it is to load data from MongoDB to Redshift (and 100s of other sources) using Hevo. Sign up today to get $500 Free Credits to try Hevo! © Hevo Data Inc. 2019. All Rights Reserved.